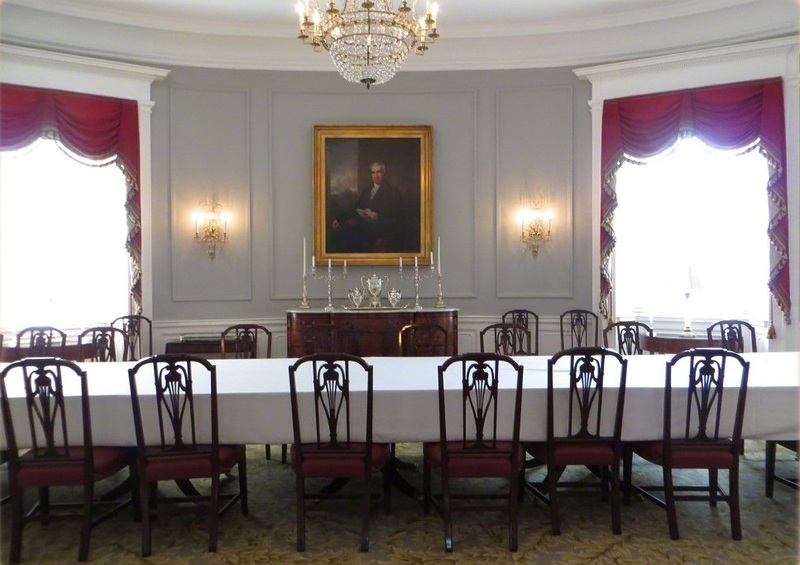 I was touring the Virginia governor’s house in Richmond five years ago when I came across a painting of James Monroe, hanging in the center of the state dining room. He was there because, we were told, it was the 200th anniversary of the completion of the house, and it was James Monroe, then governor of Virginia, who signed the 1811 law that authorized the build. The portrait was on loan, for a year, from the James Monroe Museum in Fredericksburg, Virginia. The portrait was back at its home in Fredericksburg when Patricia and I visited the James Monroe Museum and Memorial Library this past October. James Monroe was born in what’s now called the Northern Neck of Virginia (as were George Washington and James Madison), a peninsula jutting east toward the Chesapeake Bay, about two hours south of DC. He dropped out of William and Mary to fight in the Revolution, and was quite the hero (he crossed the Delaware with Washington, was wounded at Trenton, camped at Valley Forge and took part in the Battle of Monmouth). After the war, he studied law under Thomas Jefferson (with whom he became BFFs) and he set up a law practice in Fredericksburg. Monroe’s great-granddaughter thought that the brick building, above, held his law offices when she bought it and, in 1926, opened a museum and library dedicated to Monroe there. Turns out that while the property had belonged to Monroe, the building isn’t old enough to have been his law offices. Still, it makes a very nice, atmospheric setting for a history museum. Monroe became the fifth president of the United States in 1817 and many of the objects in the small (but jam packed) museum are linked to his presidency. The Monroes were the first presidential family to occupy the rebuilt White House, after it had been burnt down by the British in 1814, and it was fairly empty when they got there. So they did a lot of furniture buying. In 1817, the Monroes made a mega-order to a French company (they were very fond of French decorative styles), for the White House. 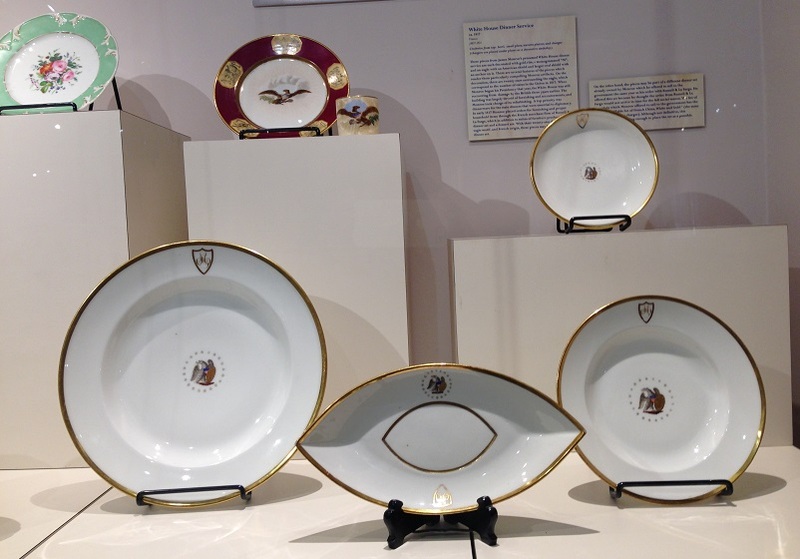 This gold-rimmed dinner set, used by the Monroes for official White House entertaining, may (or may not) have been part of that order. 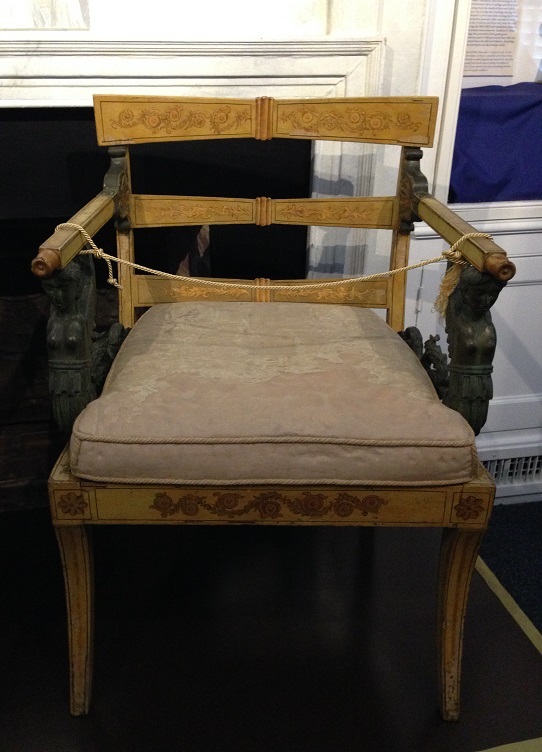 French in style but probably made in America, the c1810 (one of two at the museum) chair, below, was bought by the Monroes for the White House. They’re part of a larger set, the rest of which remain at the White House. The only piece of information I could have told you (pre-History Tourist) about James Monroe’s presidency was that his name made up half of the term “Monroe Doctrine.” The doctrine outlined one of the first major pieces of US foreign policy (expressed by President Monroe in his annual address to Congress in 1823): that the US would not tolerate European interference in the affairs (including but not limited to colonization) of any country in the western hemisphere. 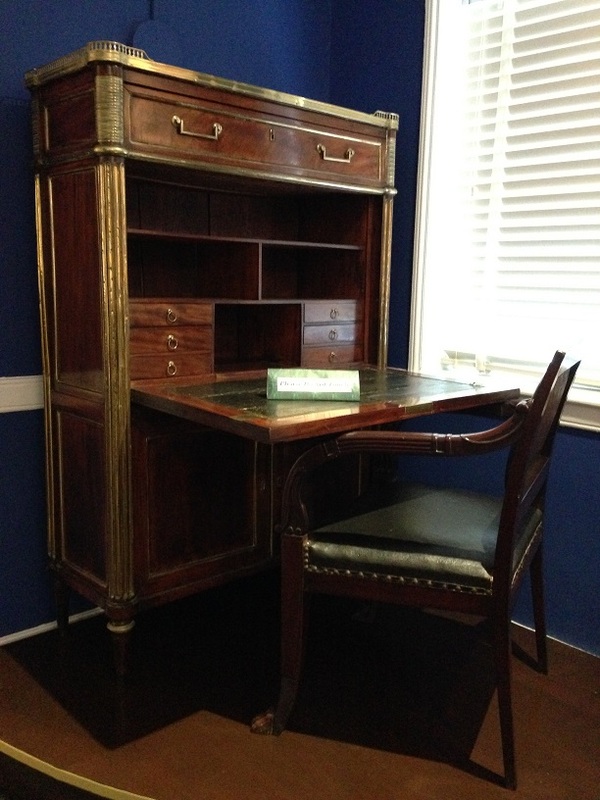 Monroe family lore says that the c1795 desk, below, bought by the Monroes in Paris while he was the US ambassador to France and taken to the White House, was where Monroe wrote his Doctrine. He might have jotted down some ideas at the desk, but most give primary authorship of the doctrine to then Secretary of State John Quincy Adams. The Madison Museum, small though it was, was definitely worth the visit. I wish we’d also had time to visit more sites in and around Fredericksburg. A major Civil War battle was fought there. And I missed a few Stalking George Washington opportunities. GW’s boyhood home at Ferry Farm is just outside town, and about a block from the Monroe Museum is the house that GW bought his mother. His sister also lived in Fredericksburg and he stayed at her house, Kenmore, during his 1791 tour of the southern states. It’s within walking distance of the house GW bought for their mum — his sister probably didn’t thank him for that. 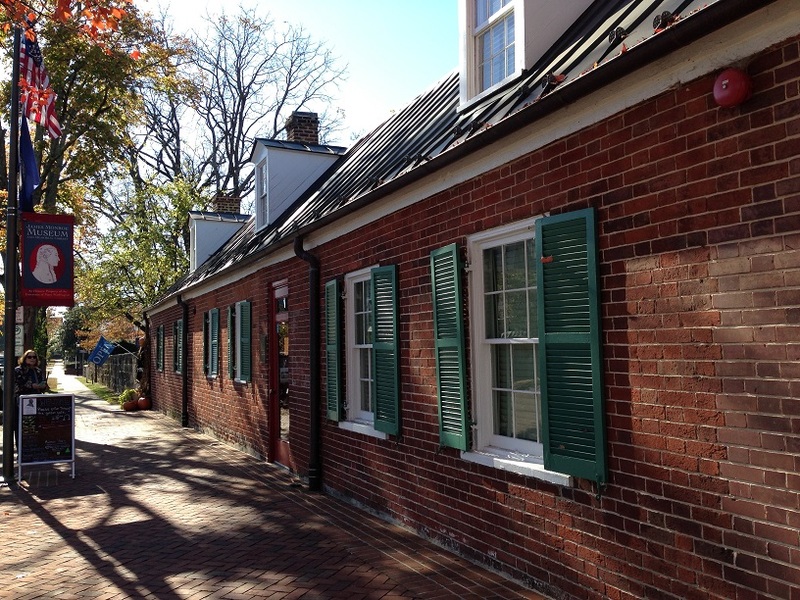 Mary Washington lived the last 17 years of her life in that house, before dying of breast cancer. October is National Breast Cancer Awareness Month in the US and when we walked by that gorgeous October morning, the fence in front of her house was lined with pink ribbons. 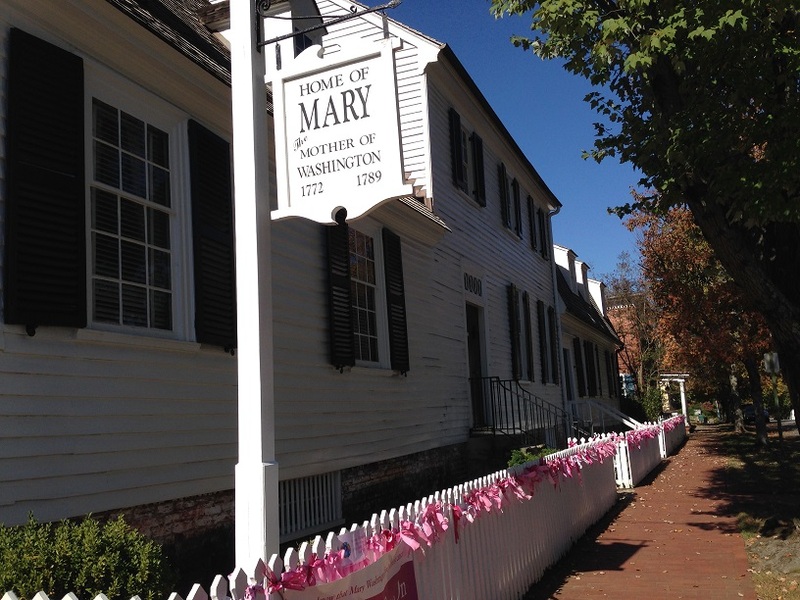 It was part of the museum’s annual Mary’s Ribbons campaign, which invites the community to tie a pink ribbon on their fence, to remember Mary Washington and others who have faced breast cancer. Gallery | This entry was posted in Virginia and tagged breast cancer, Fredericksburg, James Monroe, James Monroe Museum, Mary Washington. Bookmark the permalink.